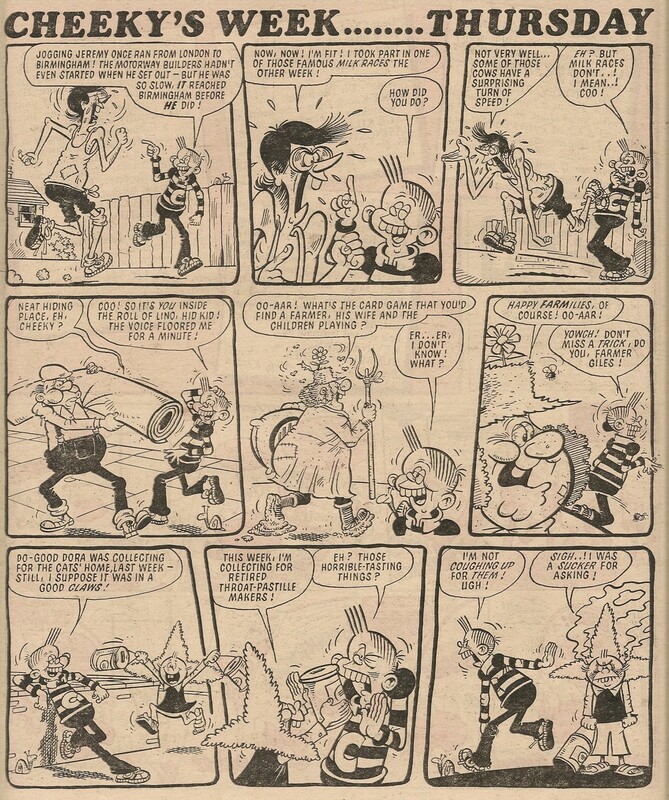 Burpo's Mum and Dad first appeared in the Cheeky's Pal strip devoted to their 'orrible offspring in Krazy dated 25 June 1977, four months before Cheeky's own title elbowed its way onto the comic-packed counters of the nation's newsagents. 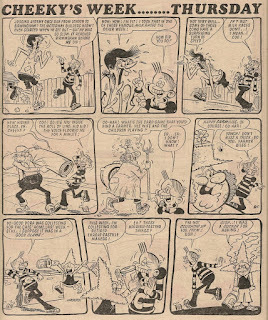 In fact, that single Krazy appearance was the only time Burpo's Dad featured in the comic that spawned Cheeky, although his mum made one more Krazy appearance, in the 'Ello I'm Cheeky strip in the 02 July 1977 issue. 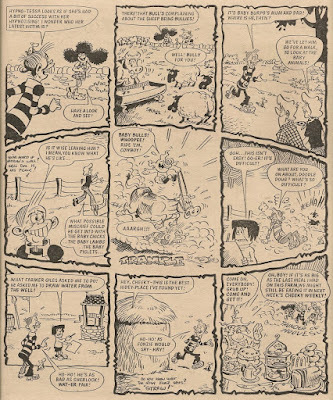 This set the pattern for Cheeky's relationship with Burpo's parents, who were seemingly unaware of (or were in denial about) the evil machinations of their precious progeny and, disapproving of what they saw as Cheeky's inappropriate behaviour, continually reminded our toothy pal of the malevolent moppet's delicate nature. 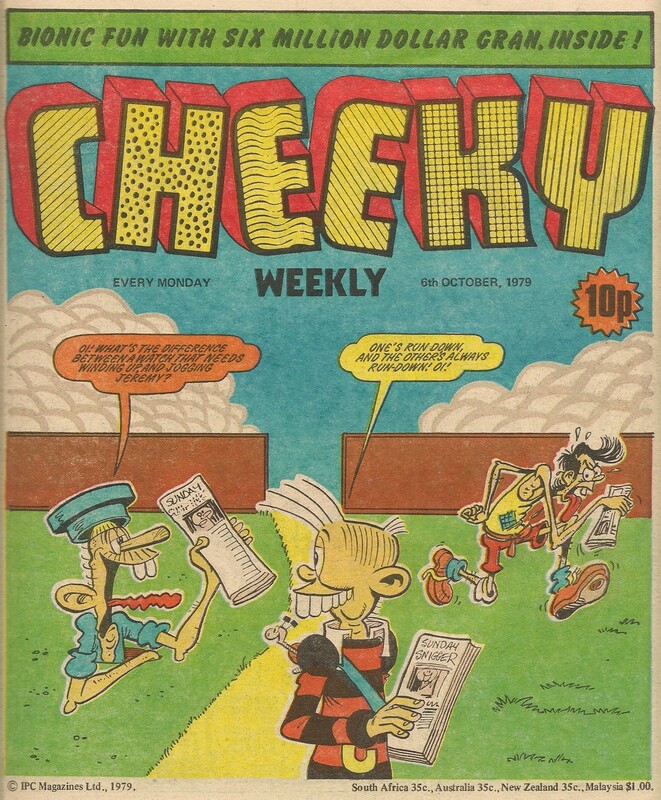 Whereas the majority of Cheeky's supporting cast were a fairly peripatetic bunch in terms of their overall distribution across the pages depicting Cheeky's Week, Burpo's parents were mainly associated with Wednesday's intro to Creepy Sleepy Tale. 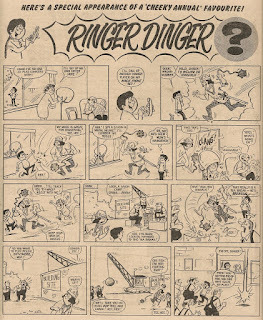 However, neither appeared in the comics dated 31 December 1977 (the week of the Creepy Pantomime), 05 August 1978 (the issue in which Teacher became unstable) and 19 August 1978 (the 60-years-into-the-future issue), and Burpo's Mum featured in the Wednesday (conclusion) feature in the comics dated 10 December 1977 and 07 January 1978, while his dad appeared in the same feature in the 25 February and 22 July 1978 editions.. 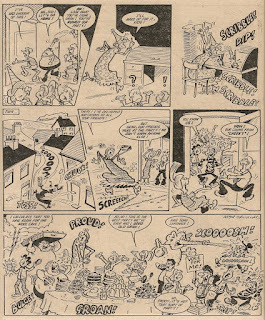 The final Creepy Sleepy Tale appeared in the comic dated 26 August 1979, being replaced in the subsequent four issues by instalments of the pull-out Crack-A-Joke Game. 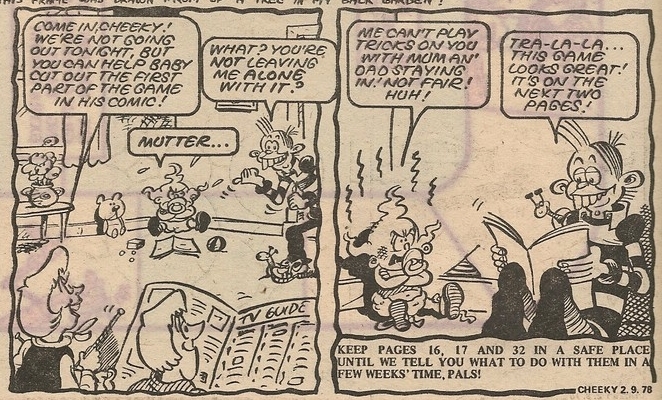 However, for the first three of those weeks Cheeky continued to make his Wednesday visits to Burpo's house, only to be told by the inimical infant's parents that they were not going out, and his babysitting services were therefore not required. They instead invited him to assist Burpo in assembling the game, elements of which appeared on the following page. 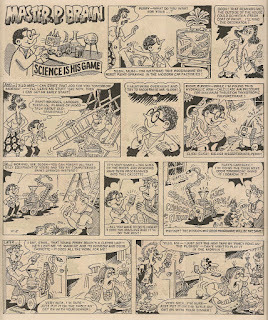 Burpo's parents were then absent from the comic (after Creepy Sleepy Tale came to an end, Cheeky was apparently no longer required as babysitter) until the issue dated 13 January 1979 when Mum featured in The Burpo Special, the subject of which was Doctor Braincell. 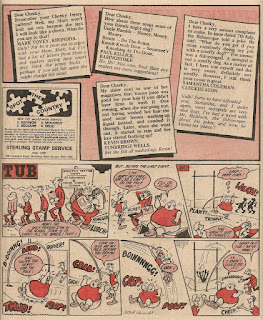 Mum then appeared on Easter Saturday in the 14 April 1979 comic, before turning up in a further two Burpo Specials; 28 April 1979 – Jogging Jeremy and 26 May 1979 – Manhole Man. 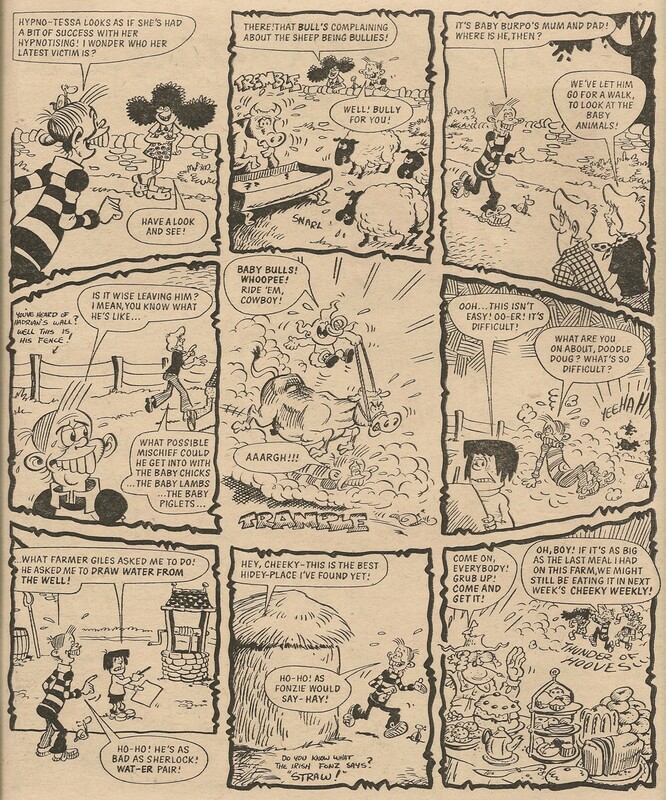 The final Cheeky Weekly appearance of Burpo's parents was during Cheeky's Saturday visit to Farmer Giles in the 21 July 1979 comic. 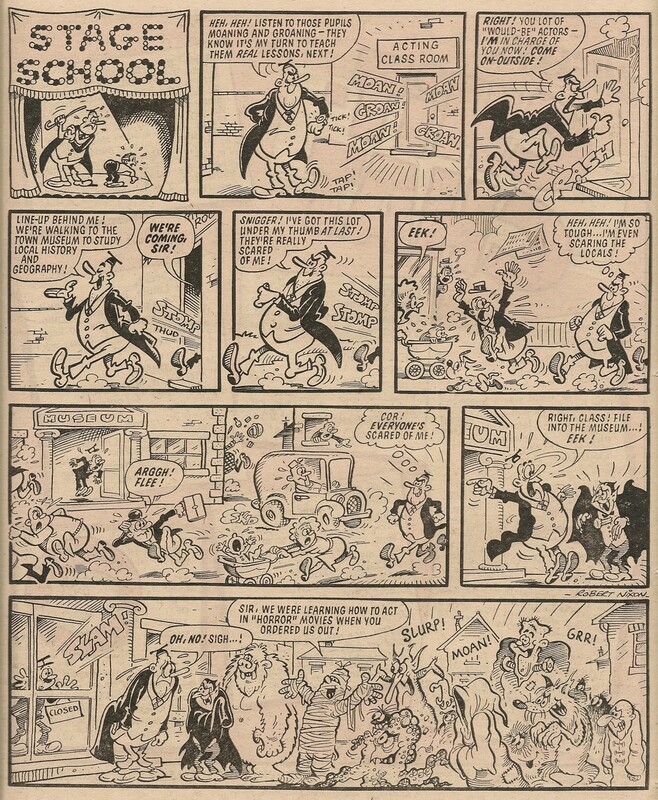 from artwork drawn by Frank McDiarmid. 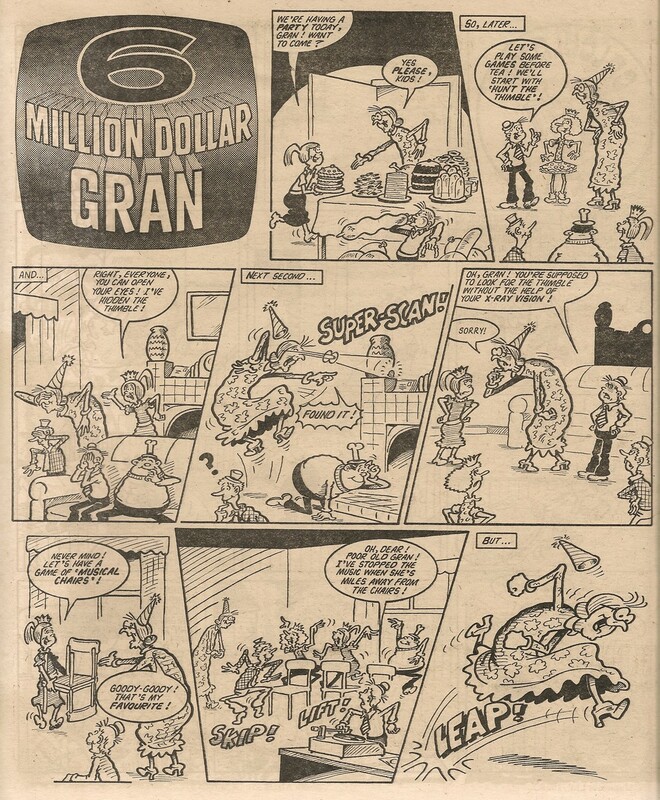 The above-title banner again refers to 6 Million Dollar Gran as bionic whereas, as readers who've been following the title since issue one will know, she's a robot. 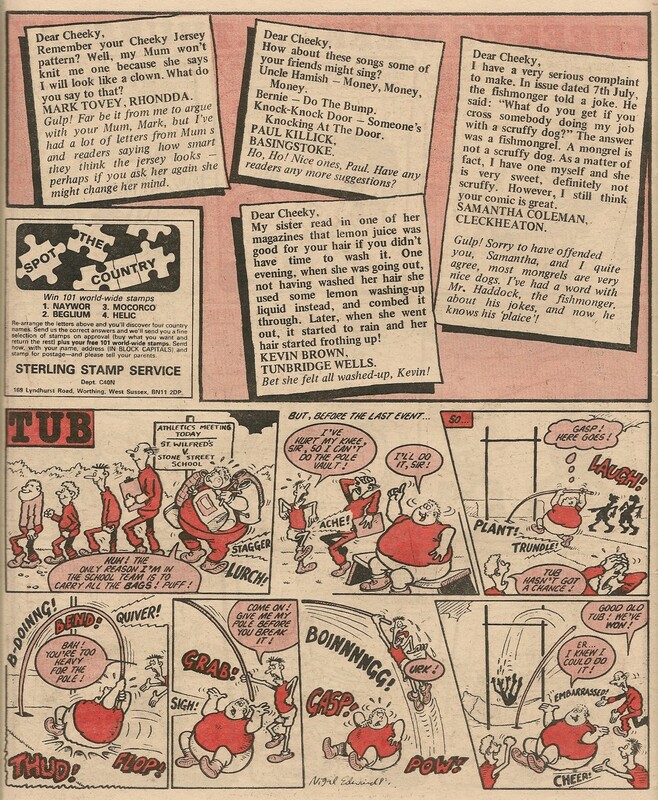 The rather minimalist, odd-looking cover illustration this week is the result of cover cannibalism - the images of Manhole Man, Cheeky and Jogging Jeremy first appeared on the front pages of the 09 June 1979, 11 August 1979 and 20 January 1979 comics respectively. 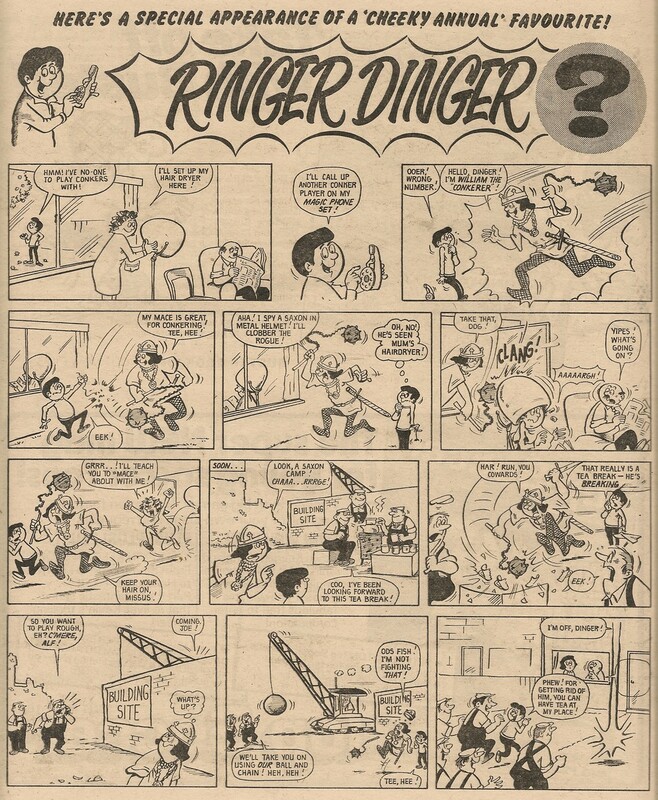 However, the most striking thing about this cover is the absence of something. 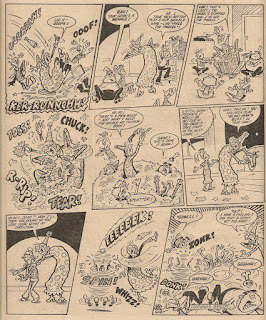 This is a landmark issue of the toothy funster's comic, yet there's no mention of that fact on the front page (nor anywhere inside). 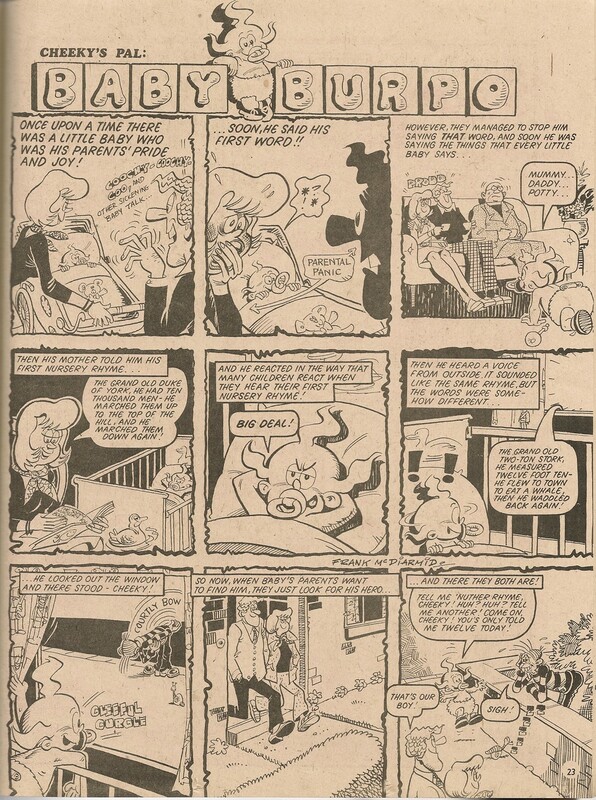 The 1970s has seen new comics regularly terminate with unseemly haste. 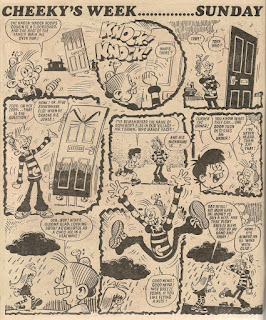 Krazy, the title from which Cheeky Weekly erupted, managed to survive for only 79 issues as did Shiver and Shake, while Monster Fun troubled newsagents' delivery boys and girls for a mere 73 weeks. 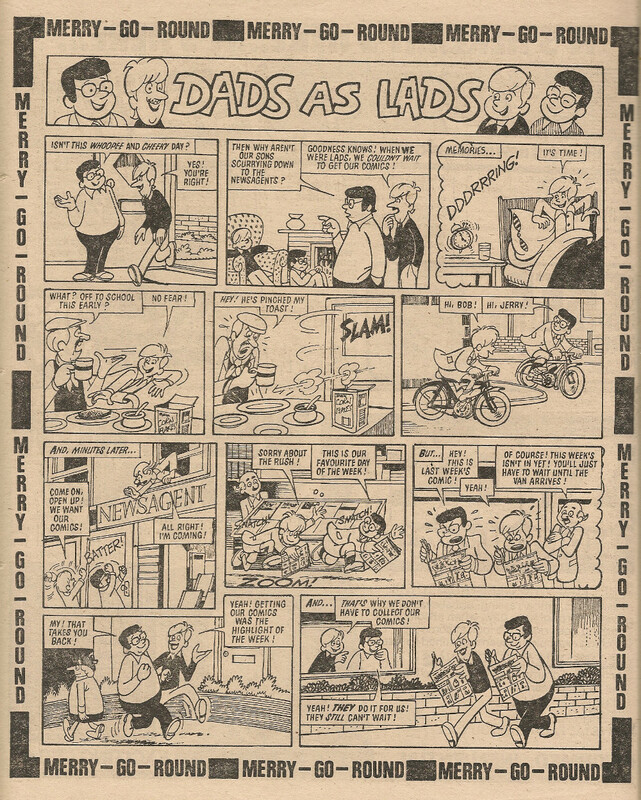 One would think that IPC would be keen to celebrate the relative longevity of our grinning pal's comic as it reaches its 100th issue. 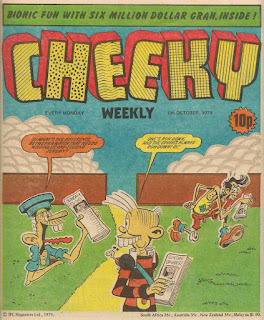 Anyway, the fact that Cheeky Weekly has reached its century is testament to the talented artists and writers whose work on this groundbreaking title has kept it buoyant, thus thwarting the accountants who are so keen to cull comics that are perceived to be underperforming. 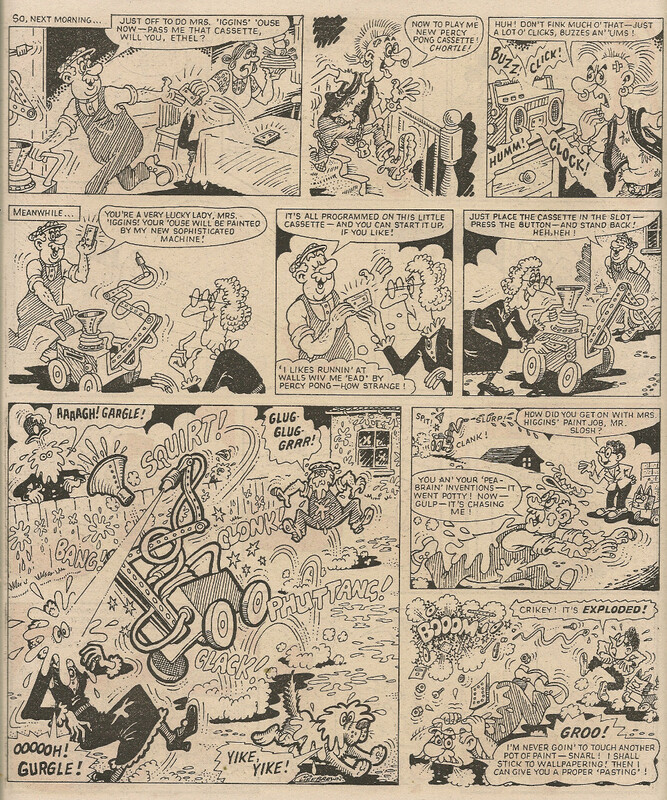 Mike Lacey is the artist depicting Cheeky's Sunday on page 2, but it seems the toothy funster concluded his paper round immediately after the cover gag as there is no sign of the deliveries we usually witness in this location. 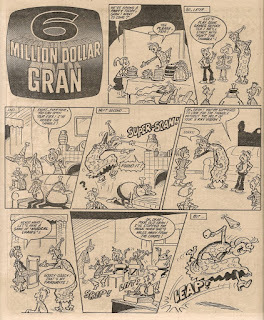 The final panel of Gran's story, with a caption carrying a phrase such as “Join the party in our 100th issue”, would have made a better front cover for this edition. But who is the character wearing glasses and chomping on a sausage roll in front of Elephant? 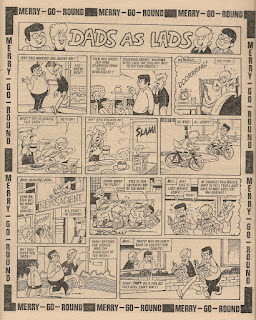 Nigel Edwards did a great job in depicting a selection of characters from across the comic but did he, seeking reference material for his artwork, somehow confuse Dads As Lads (which made its debut in Whoopee! 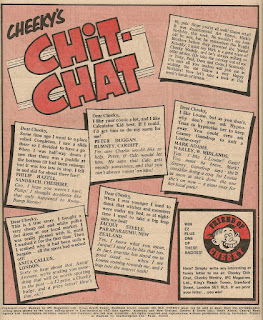 in 1976), with Cheeky Weekly's own paternal/filial feature Why, Dad, Why? 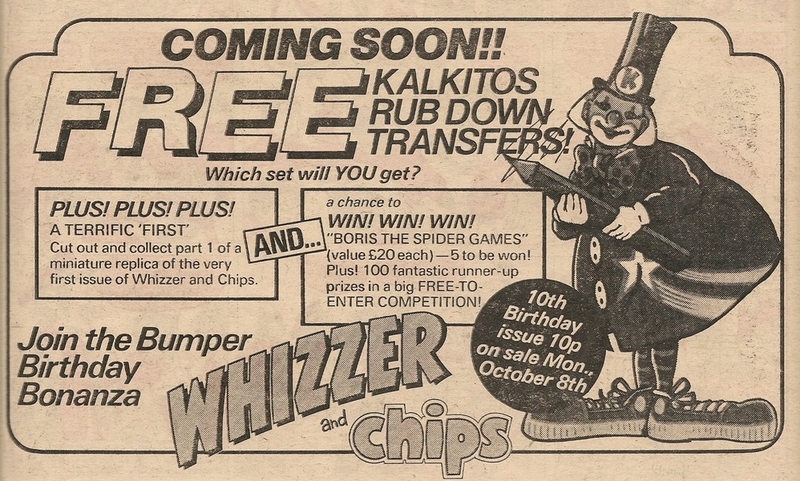 Page 11 does carry news of a special celebratory comic, but it's an advert for the 10th anniversary issue of Whizzer and Chips, containing a free gift plus part one of a mini facsimile of the debut edition. 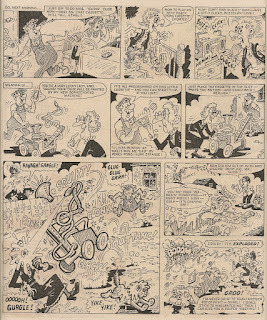 The aspiring artistes of Stage School appear only in the final two panels of this week's story, and even then they are unrecognisable. The Chit-Chat page contains another reference to celebrations, but this time the festivities are in honour of the art editor's birthday. 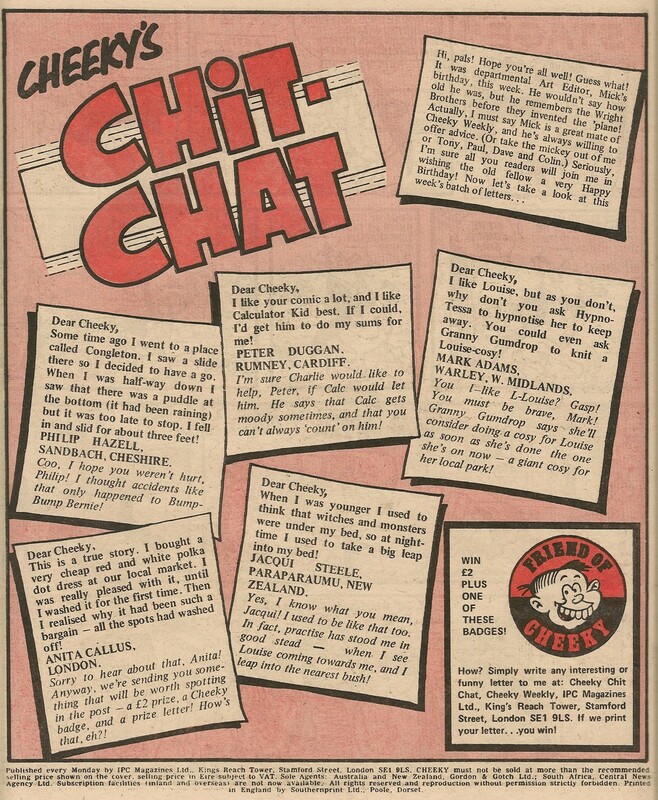 On Saturday Cheeky is tasked with walking the neighbour's dog, a Saint Bernard. 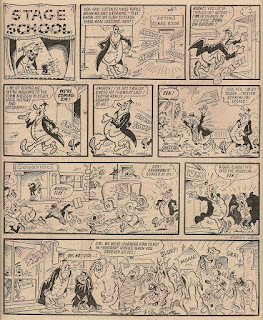 Canine comedy ensues, before attention turns to the back garden in Snail of the Century which, as has become the tradition, brings the comic to a close. Mike Lacey and Jimmy Hansen each provide 4 Cheeky's Week elements this week, with Frank McDiarmid being represented thanks to the art assistant's work with scissors and glue on the front cover.